While the woodland caribou, Rangifer tarandus caribou (boreal population), boreal woodland caribou or boreal caribou, which is mainly sedentary, was assessed in May 2002 as threatened by the Committee on the Status of Endangered Wildlife in Canada (COSEWIC),    not all herds and populations are endangered. For example, the Gros Morne National Park sedentary herd in insular Newfoundland is not endangered. In west-central Alberta there are two ecotypes – boreal and mountain. The species taxonomic name Rangifer tarandus (reindeer or caribou) was defined by Carl Linnaeus in 1758. The subspecies taxonomic name, Rangifer tarandus caribou was defined by Gmelin in 1788. According to the then- Canadian Wildlife Service Chief Mammalogist, Frank Banfield, in his often-cited A Revision of the Reindeer and Caribou, Genus Rangifer (1961),  R. t. caboti (the Labrador caribou), R. t. osborni (Osborn's caribou (from British Columbia)) and R. t. terraenovae (the Newfoundland caribou) were considered invalid and included in R. t. caribou. In Québec there are three ecotypes with specific habitats and behaviour. Bergerud, et al. ; compared the sedentary ecotype caribou (Bergerud 1988b) in southern Ungava (south of 55°N) to those farther north, the migratory ecotype Leaf River caribou herd (LRH) and the George River caribou herd (GRCH). In southern Ungava caribou females disperse from other females to avoid predators (Bergerud and Page 1987). The land is changing and the impacts of climate change, industrial development, and the growing human population and easier accessibility of the herd cannot be ignored in the management actions to be put forward. With the exponential rate of development, the protection of caribou habitat is greatly deficient and needs to be addressed seriously. The Government of Nunatsiavut recommended that the "George River caribou calving grounds by designating a 14,000 km2 protection zone under the Regional Land Use Plan for the Labrador Inuit Settlement Area." Caribou generally travel upwards of 2,000 kilometres (1,200 mi) annually and live in an area of about 1,000,000 square kilometres (390,000 sq mi). Some individuals have been observed traveling 6,000 kilometres (3,700 mi) in a single year. The caribou population varies considerably, for unknown reasons, and their numbers have apparently peaked in the later decades of each of the 18th, 19th and 20th centuries. The most recent decline at the turn of the 20th century caused much hardship for the Inuit and Cree communities of Nunavik, who hunt them for subsistence. By 1950, as few as 5000 caribou remained in northern Québec and Labrador. In late September 1984, about 115 kilometres (71 mi) south of the northern village of Kuujjuaq, Québec, about 10,000 caribou (appr. 2% of the George River herd) drowned while crossing the Caniapiscau River, immediately above the Calcaire (Limestone) Falls. The Caniapiscau River confluences with the Larch River downstream from Calcaire (Limestone) Falls to create the Koksoak River that flows into southern Ungava Bay. Although the caribou regularly criss-cross northern rivers and lakes and can swim 10 km at a stretch, northern rivers and lakes often claim lives during their annual migrations. At the time of the accident, observers raised questions about Hydro-Québec's management of the newly built reservoir on the headwaters of the Caniapiscau River,  some 450 kilometres (280 mi) upstream, and focused their attention on decisions made in the days following the exceptionally heavy rains in September 1984. The Caniapiscau Reservoir is part of the La Grande hydroelectric complex in northern Québec. The waters of the upper Caniapiscau River, which flow north, were diverted into the La Grande River of the James Bay watershed to the west. The dead caribou drifting and beginning to accumulate along the eastern shore line of the Koksoak River were first noted by the residents of Kuujjuaq, but the cause of the deaths was not confirmed until a team of wildlife biologists and technicians from the Newfoundland-Labrador Wildlife Division arrived by helicopter to participate in a joint cooperative effort with the Québec Recreation, Hunting and Fishing Department to live capture and radio collar caribou swimming across the Koksoak River. Kuujjuaq residents, who were familiar with the river, reported seasonal water levels far higher than normally recorded in recent history. Autumn boat stages, shore line cabin sites and tributary beaver lodges were being flooded. While the dead caribou were thought to have drowned, confirmation was not determined until the Newfoundland-Labrador Wildlife Division used the helicopter to trace the increasingly larger accumulations of floating dead caribou back approximately 115 km upstream from Kuujjuaq to the base of Calcaire (Limestone) Falls on the Caniapiscau River. Coves and backwater were choked with the floating carcasses of dead caribou, with accumulations becoming increasingly larger in approaching the base of the Falls. In a short analysis, Québec’s Indian and Inuit Secretariat (SIGMAI) expressed the opinion that the fast-growing George River herd may have become accustomed to the reduced water flow from 1981 to 1984, during which time the reservoir was being filled. SIGMAI hypothesizes that the caribou may have been surprised as the water flow of the Caniapiscau River was partially restored to its natural state in mid-September 1984, after the filling of reservoir had been completed. The partial release of the headwaters back into the Caniapiscau was necessary because the power stations on the La Grande River could not yet turbine the full water flow. According to Hydro-Québec, any major addition of water to the La Grande River would by necessity have been diverted around the power stations for months, even years, and seriously damage the floodgates which were designed for temporary use during exceptional climatic events. Thus, SIGMAI chastised the Société d'énergie de la Baie James, a subsidiary of Hydro-Québec, that had just completed the construction of the reservoir, for not having planned to actively manage the restored water flow to the Caniapiscau River in such a way as to protect the caribou herd from exceptional floods caused by heavy rains or rapid spring thaw. This was a rather novel idea at the time, as no Canadian wildlife expert had foreseen anything more than the usual mortality along the rivers of the region (up to 500 deaths every year). The Québec game officials did, however, put forward the opinion that a dynamic management of the water levels and flows of the Caniapiscau Reservoir could have avoided the high mortality observed in September 1984, either completely, or at least reduced it to levels observed in recent years. SIGMAI finally recommended that the water levels of the reservoir be lowered by about 0.5 metres (1 ft 8 in) for several months of the year to avoid the use of the flood gates during extreme rainfalls when the caribou are migrating in late summer and early fall. Of course, this is largely a moot point today, since virtually no water has been diverted back into the lower Caniapiscau since 1985. Furthermore, a fence was installed to divert the herd from the danger zone near the Calcaire Falls. Human-caused landscape disruption is the chief cause of caribou range recession. For example, the conversion of forests by logging may result in greater abundance of other ungulates, like moose, and increased predation by wolves. Linear corridors, such as roads, utility corridors, and trails may improve travel speed and hunting efficiency for predators, improve access for poachers, and hinder caribou movements. Cutovers from forest harvesting have been identified as the strongest predictor of caribou extirpation. This was not surprising; the northern front of forest harvesting in Ontario closely matches the southern boundary of continuous caribou occupancy and timber harvesting may lead to reduced occurrence of woodland caribou. However, there appears to be a time lag between forest harvest and disappearance of caribou. Research suggests that there is a two-decade time lag between disturbance by forest harvest and disappearance of caribou. Forest harvest converts forest stands to early seral stages, which are favoured by moose, which in turn can support a higher wolf population than caribou alone. A higher wolf population may increase predation mortality of caribou. Thus, two decades is likely the time necessary for these faunal changes to take place. This time lag is cause for concern, as there is overlap of forest harvest with the southern boundary of caribou range in Ontario. Caribou in these areas are very likely to vanish in the next 20 years. While patterns of forest harvest show the strongest relationship with caribou extirpation in Ontario, strong correlations among landscape disturbances suggest that no single variable can be unequivocally implicated as key to caribou range recession. Woodland caribou persistence in Ontario will likely depend on the availability of large tracts of old growth forest situated at great distances from anthropogenic disturbance. Recent research suggests that forest harvest operations should be buffered from caribou habitat by at least 13 km. Climate change may have negative potential for woodland caribou as well. Climate change may further alter forest structure to favour moose and white-tailed deer, which may carry the parasite Parelaphostrongylus tenuis; lethal to caribou but not harmful to other deer. In addition, increased episodes of freezing rain in the winter may make it difficult for caribou to dig through the snow to reach their primary food source, lichens. The effects of climate change on woodland caribou have not been studied. 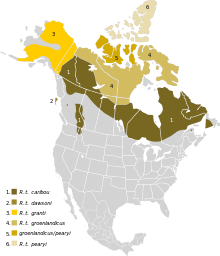 In the United States the woodland caribou is one of the most critically endangered mammals, with only a few woodland caribou found south of the Canada border each year. In the US there is only one naturally occurring herd of woodland caribou in extreme northern Idaho, northern Montana, eastern Washington and British Columbia, Canada, of about 40 animals. There is, however, a concerted effort on the part of the North Central Caribou Corporation and the Boundary Waters Canoe Area Wilderness to reintroduce a herd of around 75 animals from the Slate Islands in Lake Superior to northern Minnesota. However, the high incidence of white-tailed deer and wolves in the region will likely prove quite problematic. ^ The Integrated Taxonomic Information System list Wilson and Geist on their experts panel. ^ The Species at Risk Act and Environment Canada do not include the Ungava caribou herds as part of the boreal woodland caribou herds. ^ Grubb, P. (2005). Wilson, D.E. ; Reeder, D.M., eds. Mammal Species of the World: A Taxonomic and Geographic Reference (3rd ed.). Johns Hopkins University Press. ISBN 978-0-8018-8221-0. OCLC 62265494. ^ Geist, V. (2007). Defining subspecies, invalid taxonomic tools, and the fate of the woodland caribou. The Eleventh North American Caribou Workshop (2006). Rangifer, Special Issue 17: 25-28. ^ a b c d e Couturier et al. 2004. ^ a b Nunatsiaq News 2011. ^ a b c d Mallory & Hillis 1998, p. 49. ^ a b c d e f g h i j Courtois et al., p. 399. ^ a b Nunavik Tourism 2010. ^ a b c d Berkes, F. 1988. The intrinsic difficulty of predicting impacts: Lessons from the James Bay hydro project. Environmental Impact Assessment Review 8: 201-220. ^ a b c d e Makivik 2013. ^ a b c d Nunatsiaq News 2012. ^ Canadian Parks and Wilderness Society and The David Suzuki Foundation 2013. ^ a b COSEWIC 2011, p. 3. ^ COSEWIC 2011, p. 10. ^ Courtois et al. 2003. ^ a b Banfield 1961. ^ Wilson & Reeder 2005. ^ Integrated Taxonomic Information System (ITIS) 2013. ^ Geist 2007, p. 25. ^ Cronin, MacNeil & Patton 2005. ^ a b Bergerud, Luttich & Camps 2007. ^ a b George 2011. ^ a b c CBC 2014. ^ a b c d e Wells 2013. ^ Bergerud, Luttich & Camps. ^ Survival International Charitable Trust 2011. ^ Shideler et al. 1986, p. 8. ^ Zager, MillsWakkinen & Tallm nd. Government of Québec, Ministère du Loisir, de la Chasse et de la Pêche (Department of Recreation, Fish and Game). 1985. Considérations relatives à la noyade de caribous du fleuve George sur la rivière Caniapiscau (septembre 1984), Québec City: MLCP, xvi+100p. (+appendices). Government of Québec, Secrétariat des activités gouvernementales en milieu amérindien et inuit (SIGMAI). 1985. Noyade des caribous sur la rivière Caniapiscau des 28 et 29 septembre 1984, Québec City: SAGMAI, 14p. (+appendices). Grubb, P. (2005). Wilson, D.E. ; Reeder, D.M., eds. Mammal Species of the World: A Taxonomic and Geographic Reference (3rd ed.). Johns Hopkins University Press. ISBN 978-0-8018-8221-0. OCLC 62265494. Racey, G.D. and T. Armstrong. 2000. Woodland caribou range occupancy in northwestern Ontario: past and present. Rangifer, Special Issue 12: 173-184. Schaefer, J.A. 2003. Long-term range recession and the persistence of caribou in the taiga. Conservation Biology 17(5): 1435-1439. Vors, L.S., J.A. Schaefer, B.A. Pond, Arthur R. Rodgers and B.R. Patterson. 2007. Woodland caribou extirpation and anthropogenic landscape disturbance in Ontario. Journal of Wildlife Management 71(4): 1249-1256.